The Rottweiler originally worked with livestock as a herding dog. This is likely where the breed of today gets its loyal and protective nature from. 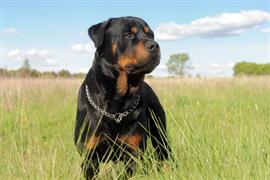 Many owners seeking protection from their Rottweiler adopt a name that sounds strong or relates to security. Sledge, Rocky, and Tyson are few popular names with strength implications. Favorite options related to security include Brinks, Norton, and Seal. Along with their task of herding, the Rottweiler was often used to pull carts of butchered meat to market. In fact the breed takes its name from Rottweil, Germany where it was popularly owned by butchers. Chop, Slaughter, and Butch are few names inspired by this early role. The Rottweiler is predominantly black and many owners select a color related name. Dahlia, Midnight, and Salem are typical choices that have ties to the breed's black coat. When the Rottweiler is not busy protecting the household it is often employed as a police dog. Copper, Trooper, Chief, and Sergeant are naming favorites related to the breed's use in accompanying officers. Some of our pages will contain a subcategory. A subcategory is a slightly more specific grouping than the main topic of the page. For a subcategory, we will include a separated table of names and corresponding descriptions. An example of a subcategory of Red Dog Names would be 'Dog Names Inspired by Red Wines'. If you have any subcategory ideas for the Rottweiler Names page, we would love to hear them. Use the form below to submit your ideas.